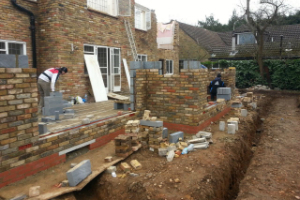 Professional Builders Services in Brent. To get a price estimation or to book a viewing for a price offer, just call 020 3746 0000 or send us an online request. Our customer care service is available 24 hours a day. Thomsons Cleaning Brent NW experts can purchase the building materials, or you can do it yourself, if you choose. We can provide you some of our other services when we are done with the building, such as: after builders cleaning and builders rubbish removal. If you combine more than one of our services, we will give you a serious discount from the price. Our builders will come to do the building job in times and days which are most suitable for you. We offer our services 365 days a year and have flexible work hours. So, if you need any refurbishments, redecoration or renewals done - book our professional builders services now! Our firm Thomsons Cleaning is a preferred provider of a wide variety of cleaning and maintenance services in Brent NW. Our builder service is no exception. Our builders are experienced and multi-skilled. We can provide every customer with excellent building and planning in accordance to your budget for the refurbishment or renovation. We provide fully insured services. Our builders are vetted and trained. They can renovate, completely refurbish or redecorate your house or office. We will give you a complete satisfaction guarantee for our builders services. Our motto is “No job is too big or too small” and we stand by it! Thomsons Cleaning Brent NW can provide you with professional painting, refurbishment, tiling, wallpapering, redecorating, flooring, plastering, electrical work, rendering, wall boarding, decking, bathroom and kitchen fitting, kitchen and bathroom remodeling, and many other builder services. In some cases, we can give you a price estimate, but it will most likely change after a viewing is done by one of our surveyors. At the viewing the surveyor will discuss the plans with you and will work together with you to fit your planned timeline and budget. An evaluator will make the calculations and will prepare a price quote for you. The offer will include the cost for our labour, the materials necessary, as well as the price for builders rubbish removal. Choose Thomsons Builders Brent NW! If you like our Brent NW offer, or if you would like a viewing to be performed, just contact 020 3746 0000 or send us an online request here. Our customer support operators are at your service 24 hours a day. We do not require any deposit be paid for our services. We offer emergency scheduling, but if you plan ahead and book early, we will give you preferential prices. If you select to combine the after builders cleaning service with the builders service we offer, we will give you sizable discounts. Regular customers, landlords and estate agencies will get preferential prices too. Book our professional builders service now, and let us make your house or office look perfect.